Apple today invited journalists to San Francisco to preview its new Union Square store, set to open this weekend. Dozens of images are being shared on Twitter and other social networks, giving us our first glimpse at the revamped store that's been under construction for more than two years. As it shows off the new location to journalists, Apple has also published a press release outlining all of the new features in the store. "Fifteen years ago today Apple opened its first two stores and we're thrilled to mark the occasion with the opening of Apple Union Square in San Francisco," said Angela Ahrendts, Apple's senior vice president of Retail and Online Stores. "We are not just evolving our store design, but its purpose and greater role in the community as we educate and entertain visitors and serve our network of local entrepreneurs." The store features a next-generation design that's been adopted by other retail locations in Brussels and Memphis, with wide, open spaces, high ceilings, enormous windows, redesigned product display areas, and a 6K video screen that spans most of one wall. Unique to San Francisco is a set of massive 42-foot tall glass doors that slide open 40 feet to leave the front of the store open to the street. "We have a deep commitment to the cities we work in, and are aware of the importance that architecture plays in the community," said Jonathan Ive, Apple's chief design officer. "It all starts with the storefront -- taking transparency to a whole new level -- where the building blends the inside and the outside, breaking down barriers and making it more egalitarian and accessible." 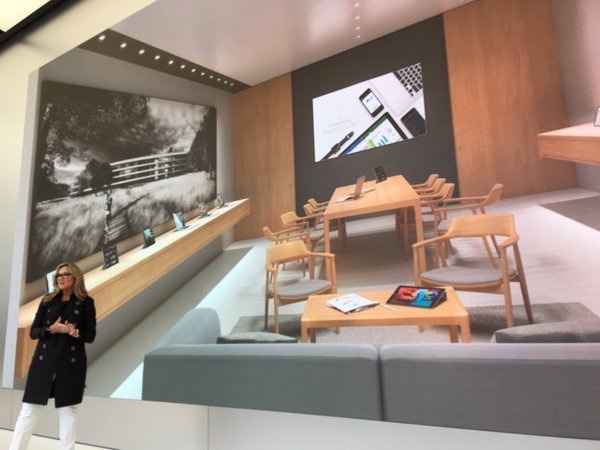 Apple retail chief Angela Ahrendts was on hand to walk journalists through some of the new features installed in the store, including a 50-foot green wall accessible through a second set of doors that open out onto an area Apple has nicknamed "The Plaza." Included in this area is seating for 200 people and a fountain created by sculpture artists Ruth Asawa, positioned front and center. Apple agreed to incorporate the fountain, which has long been located in that spot, as part of the redesign. The Plaza will feature a regular weekend series of acoustic performances. In the back of the store, for small business customers, there's an area called "The Boardroom" with a conference table, couches, a product demo area, and a large television screen. 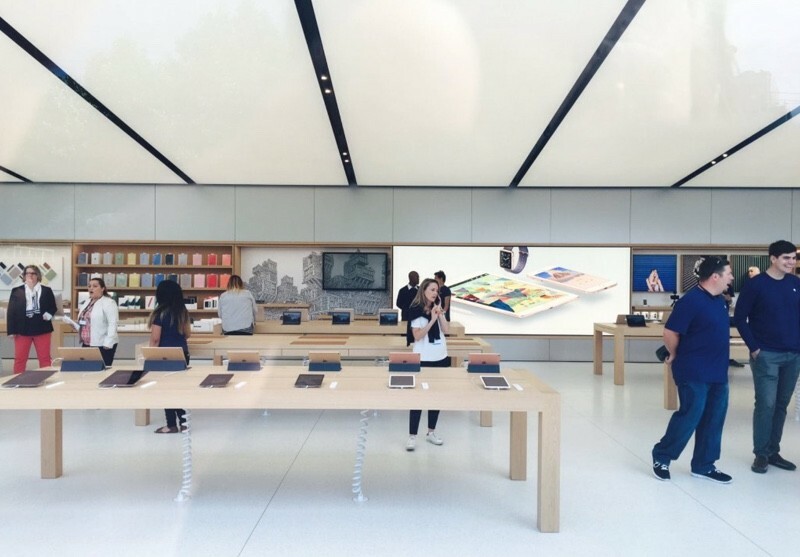 The Apple Store is organized into distinct sections, such as Genius Grove, where users will get help with their Mac and iOS devices, and "The Avenue," where customers will be able to try accessories and find Apple-exclusive third-party products. A new position at the store, the "Creative Pro," will see employees offering advice and expertise on the creative arts. A main area, called "The Forum," houses the aforementioned 6K Video Wall and is designed to bring artists, photographers, musicians, and more to inspire and educate customers through year-round programs for kids, monthly events for teachers, sessions for developers, Game Nights, and Creative Sessions. The grand opening of the new Apple Store in Union Square will take place on Saturday, May 21 at 10:00 a.m. I still don't understand why they don't feed the cable through the feet of the table. Everything would look so much more cleaner and elegant. Is MacRumors really run by Google, or are the forums just occupied by a bunch of people in urgent need of enemas? Seriously, on what is allegedly an Apple fan site, an article on the preview of a new SF store immediately yields 75+% negative comments. You never saw a football crowd boo their own team? This is how Apple fans feel now. They are more in highlight these days for store openings and gossip articles than they are for actual product launches. Are we living in a Post-Apple era? Ive is not an architect and not an interface designer. He has no clue. Go back to the lab and design a mouse with a charging port on the side and a pencil with a female connector instead of a male and iPhones and iPads without bumps. Instead now is even ruining the store's interior design. Him and Tim are the most egomaniac people in the planet and the board should fire both of them. MacRumors News Threads depress the crap out of me lately. It's like reading any article about Apple in 1996. The best days are over, the end is nigh! Jeez guys, just switch to Windows 10 already. Some of the people on here need to get over it. Apple now is a mass market consumer products company. The days of the whole "Apple store buying experience" and how special you felt for buying an Apple product are long gone. they can put a lot of new watch bands in there.